What are your strengths and weaknesses? How can you improve those weaknesses and leverage on your strengths, in order to secure scholarships and jobs in the future? Those were some of the questions posed to some 100 top NYP students who attended a one day “Interview, Scholarship & Career Preparatory Workshop” held on 22 June 2010. In the morning, the students were introduced to a framework for career planning and guided through several exploratory and self-discovery exercises. This helps them to have a better understanding of themselves and learn more about their skills, strengths and weaknesses. They discussed career planning and completed worksheets on skills investigation, values assessment, and career interests. “We encourage the students to know more about themselves, what makes them unique, and to know how to promote their positive traits effectively,” said Ms DJ, one of the coaches from Brightsparks. After lunch, the participants worked in groups and practised role playing in mock panel interviews, where they learnt how to ace an interview. They are young, earnest, and enthusiastic. They are also driven by a strong desire to pick up professional skills to help others. NYP’s first batch of 26 students from the Diploma in Social Sciences (Social Work) course started term since April 2010. This new course aims to train Social Work Associates to meet the increasing manpower needs of the social service and healthcare sectors in Singapore. The students in this course recently received a boost with a new sponsorship scheme called the Social Work Associate Training Sponsorship. This new sponsorship has been introduced by the National Council of Social Service (NCSS), with the support of the Ministry for Community Development, Youth and Sports. Ten students have been offered this sponsorship, which covers tuition fees, other compulsory fees and an allowance for books and reference materials for their three years of study. The students received their sponsorships from Ms Ang Bee Lian, CEO of NCSS during a ceremony on 20 July 2010. Many congrats to our students! A sudden drop in temperature to below 10 degrees Celsius in Hainan sent two groups of students and their lecturers scrambling for warm clothing. “We had expected similar weather to Singapore’s, so we were not prepared for the sudden drop in temperature. The first thing we did was to buy warm clothing,” recalled School of Information Technology lecturer Dr Alan Ang. Dr Ang was leading a group of NYP students on an Overseas Community Service project in Hainan, China last March together with School of Interactive & Digital Media (SIDM)Lecturer Wendy Tan. Another group of students were led by SIDM lecturer Clyda Puah and School of Engineering (Manufacturing)lecturer Charlie Tan. Preparation for the 17-day trip took about six months. It included recruitment, first aid training, as well as bonding sessions to foster team spirit and camaraderie among the student volunteers. During the trip, the main tasks of the two groups were: the teaching English and Arts & Crafts at a primary school, the painting of the school, as well as painting an old folks home. The dreary and cold weather in Hainan proved a challenge but the team persevered to complete the tasks. specialisation helped us to complete the task more efficiently, without compromising quality. The sense of achievement when all tasks were completed was our greatest fulfilment,” said Dr Ang. and loving home for 34 children aged between six and 16. “We set up five computers so that the children can learn to use computers. Our students introduced various methods of teaching English such as through songs and simple composition. They also taught the children, as well as how to use a camera, about hygiene and also origami,” said Ms Tan. The team also painted the wooden volunteer house, assisted the orphanage with simple farming tasks and helped update the Orphanage’s website. They also took part in a rice soup programme organised by the Jesuit Service Catholic Church for village kids and also donated clothes at Peak Sneng – one of the poorest villages in the province. “The students worked hard and were happy that their work was recognised. The students and I were definitely humbled from the experience,” said Ms Tan. A group of 17 School of Health Sciences (SHS)students spent a meaningful two weeks of their March term break doing community service in Wiang Kaen, a district in Chiang Rai, Thailand. The project was led by SHS lecturer Dr Bala S. Rajaratnam. “We worked with the Lions Club of Singapore, Somerset to secure story books and textbooks from their outreach program Project Reading mms. We also contacted the Singapore-Thai Chamber of Commerce to identify two deserving schools which would benefit from the project. Besides sorting the books, the students also created skits to excite the children to learn English. The skits were even tested with children at the NYP child care centre. The preparation took about three months,” said Dr Bala. The students taught English skills to children below the age of 12 at the the Panghud Sahasart School and Koon Kuat Pittiya School. They also equipped and furnished three libraries at the schools with some 2,000 donated books, complete with a cataloging system for the loan of books. In addition, the team also educated children from the nearby villages on the importance of personal hygiene and basic first-aid. According to Dr Bala, there were some minor hiccups along the way. However, the excited looks of the children’s faces made it all the worthwhile. We’re the folks from NYP’s Communications Division, and we’ve decided to start a new blog. Why this blog? It has always been our dream to have an NYP blog. A blog for NYP students, with posts written by students – on topics, issues and campus happenings that students care about. Our first blog was actually started three years ago. Called ‘We Are NYP’, the blog initially started out as one to capture the thoughts and feelings of graduating students from the Class of 2007. After that, new students joined the blog, and they wrote on a wide range of stuff – from CCAs to environmental issues, from overseas attachments to class projects. 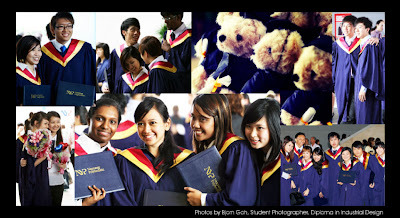 This batch of students has also graduated from NYP. So ‘Discover NYP’ is actually version #3 of our NYP blog (new, improved version, haha). We will be talking about campus topics that matter to YOU, dear NYP students. Stuff like friendships, lectures, projects with looming deadlines, sports, competitions, CCAs, food in the North Canteen, etc.... You get the idea? Our group of student writers will also be contributing posts here. Sounds exciting I hope? Do tell you what you think, and share with us what you want to read.